Artichoke with shallot vinaigrette is one of those dishes where simplicity is best. 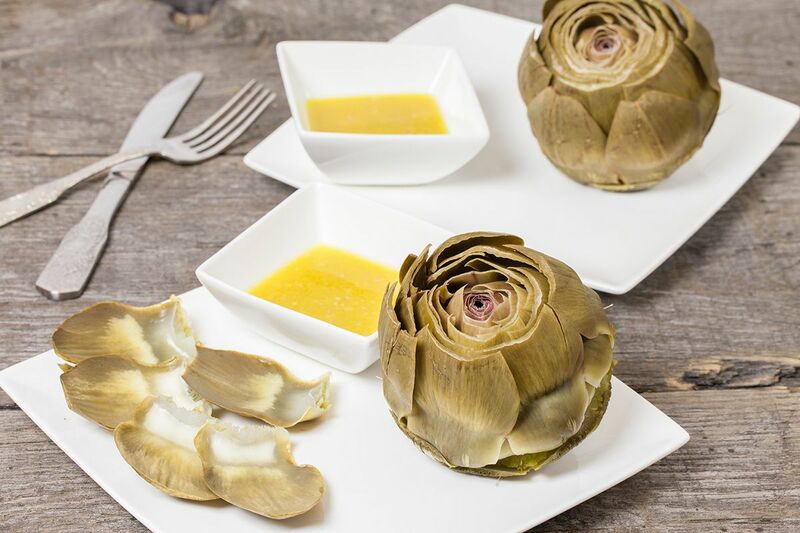 Dip these artichokes in shallot vinaigrette for a taste of summer! Remove four of the toughest outer leaves then place the artichoke at the edge of your kitchen countertop. This way the artichoke stalk overhangs the edge, grab the stalk and snap it away. This will remove the stalk and some of the tough fibres running up into the base of the artichoke. By using a large chef’s knife slice off the top quarter. Discard the stalk, outer leaves and top quarter. Cut the lemon in half and rub it over the stalk, this will prevent the artichoke is discolored. Use a sharp scissor or chef’s knife, trim away all the tips of the leaves. Repeat these steps for the other artichoke as well. Finely chop the shallot. Grab a small bowl and add in the salt along with the chopped shallots. Mix together, then add freshly milled black pepper. Add in the white wine vinegar and mustard, then mix it in using circular movements. Repeat for the extra virgin olive oil. First off, don’t ever boil artichokes in an iron pan, this will discolor the artichokes. Grab a big pan, fill it with water and some salt. Let come to a boil, then add in the lemon juice. Simmer the artichokes for 30 to 40 minutes. Use another pans smaller lid to keep the artichokes completely under water the whole time, this way the artichokes will cook more evenly. Cook until the outer leaves feels tender, you can feel this by using a knife to check the bottom of the artichoke. 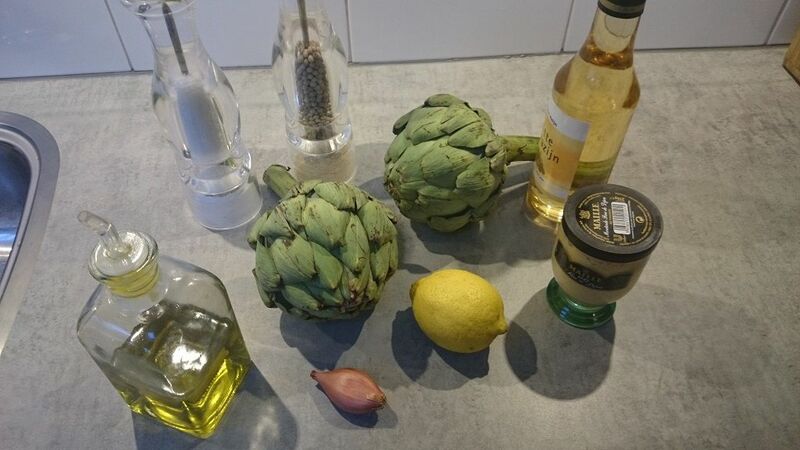 After cooking, remove the artichokes and drain upside down to get rid of excess water in the flower. 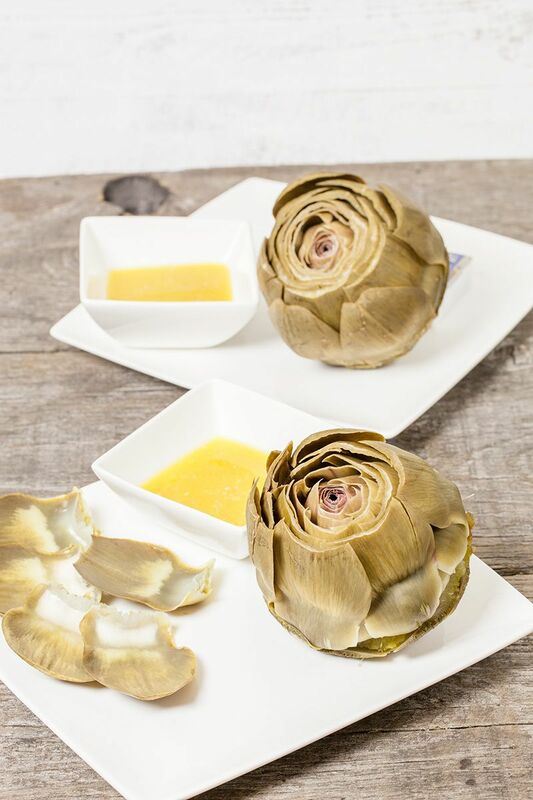 Serve the vinaigrette in a small bowl and dip the soft side of the artichoke leaves into it. After finishing all the leaves, remove the fibres and the artichoke heart will reveal itself. Cut the heart in smaller pieces and enjoy these with the vinaigrette as well. Be sure to have some napkins handy! Artichokes have always been too daunting for me to cook with but I am definitely inspired now to go out and buy some and make this delicious vinaigrette recipe. Thanks for sharing it! Thank you for your kind words, Thalia! So true about simplicity. My in-laws are French and artichokes and balsamic commonly pop up at the table. Question: would fresh-pressed verjus (no alcohol) be a good replacement for the white wine vinegar? It’s so much fun to eat with your hands, that’s one of the things I like when eating artichokes! You can replace the white wine vinegar with verjuice, since it is a highly acidic juice. Another alternative would be to use freshly pressed lemon juice.